I just tried out the Measupro programmable cooking thermometer. It works great! It has a greta feature that allows you to flip the display up which is awesome if you are trying to hold it and use the thermometer stick at the same time so you can see the display. 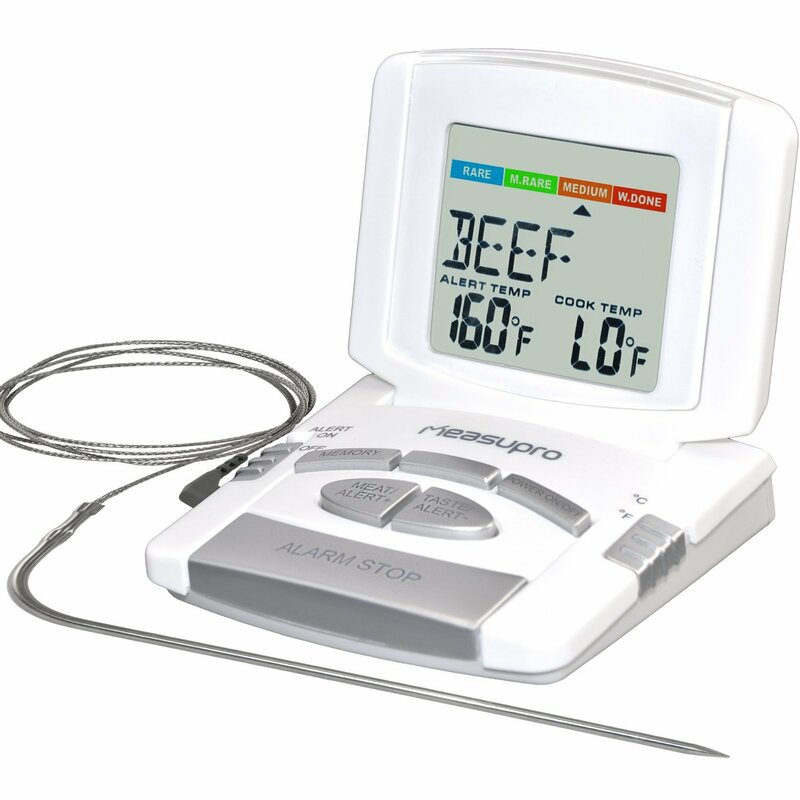 It has a long cord on the thermometer which is great because a lot of times I am trying to pull the meat out, hold the thermometer display and thermometer all at the same time. So this allows you to set the display down on the cook top and still be able to reach the food with the thermometer. It comes with a lot of pre-programmed foods like (beef, chicken, turkey, pork, veal, ham, duck, ribs, lamb). Within each preset programmed food you can then choose if you want it rare, medium rare, medium, or well done. You can also program your own settings into the display and there is a feature to save them to memory so you don’t have to keep programming them! You can use the alarm if you want so once you hit the desired temp the display will make an alarm sound to let you know. You can shut it off by pushing the alarm stop button (kind of like a snooze on an alarm clock). You can also change between Celsius an Fahrenheit. It worked great when I used it this weekend while making ribs. It was accurate compared to other thermometer and our ribs came out great! Exactly how we like them! It’s a great product, would highly recommend if you are looking for a programmable thermometer. The MeasuPro Digital Cooking thermometer will imbue you with the utmost confidence to create the perfect dishes. It is designed to make food preparations simple. Peeking into the oven to check the doneness of the food you are cooking or baking is inconvenient and causes the oven temperature to lower drastically. With the MeasuPro Digital Cooking Thermometer there is no need for that. You can select from the list of pre-programmed meats and choose from the four levels of doneness according to your taste: rare, medium rare, medium, and well done. Stick the long 36 inch probe into the center of the food, slide the alert button on the side screen, and close the oven door. The thermometer probe’s cable diameter is small enough to allow it to be closed in an oven door without creating a heat leak. It has and extra wide measuring range of 32°F to 392°F. Reading are accurate and precise so you can rely on it. Features a LCD display with large size digits. 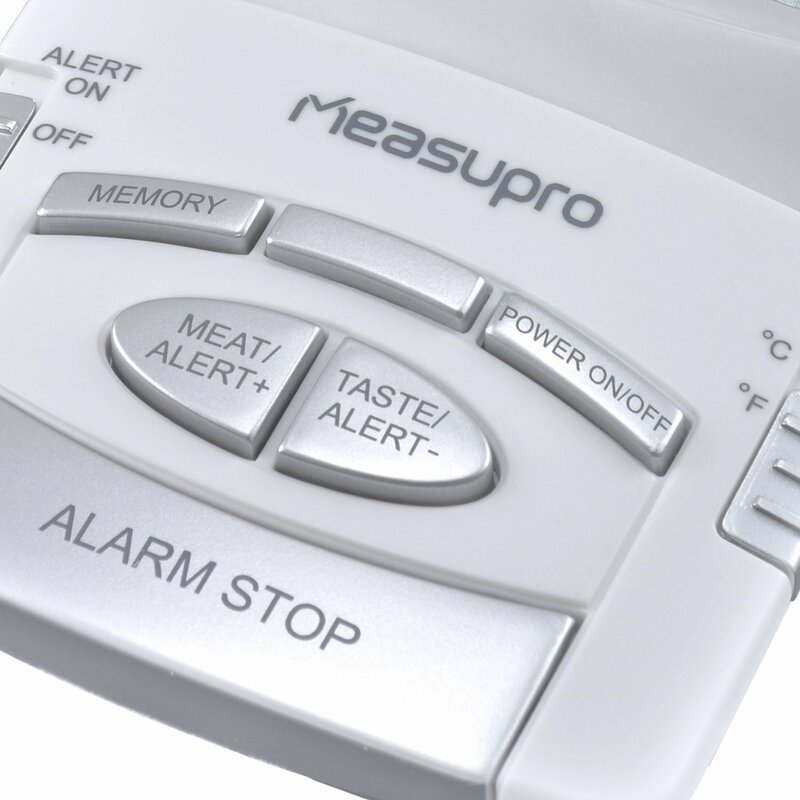 MeasuPro is intent on reducing worries… and flopped dinners! You can purchase it on Amazon for $24.99 (Prime) What a deal!